The winners of the 22nd International Theater Festival for Children and Youth were introduced during the closing ceremony held on Tuesday, October 6th, in Hamedan. Veteran Iranian director, Marzieh Boroumand, was honored for her lifetime achievements. Boroumand is most famous for her hits “Grandmother’s Home” and “School of Mice”, two popular puppet series from the 1980s. About fifty theater troupes from nine different countries attended early October to the 22nd International Theater Festival for Children and Youth. This entry was posted in music and arts and tagged Awards, Hamedan, Hamedan Province, International, Iran, Marzieh Boroumand, Photos, Theater, Youth on October 15, 2015 by socialinform. 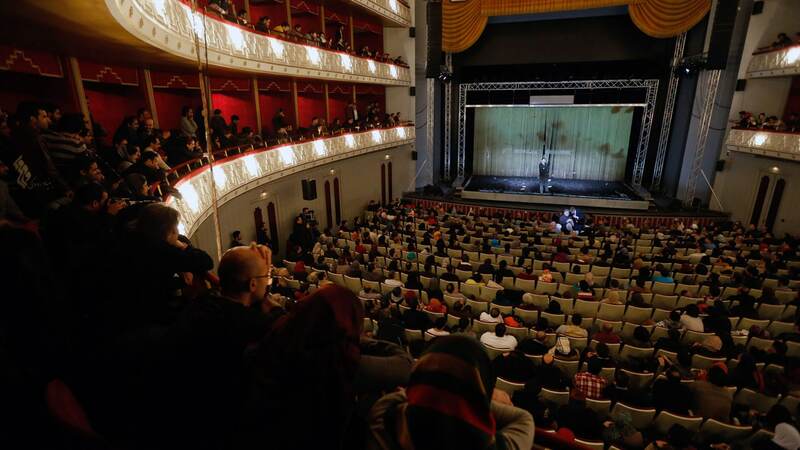 Hamedan hosted early October the 22nd edition of the International Theater Festival for Children and Youth. About fifty theater troupes from nine countries, among others Italy, Germany, Finland, Russia and England, attended the festival and competed in different sections (children, youth and international). Besides their performances the troupes also arranged several workshops. This entry was posted in music and arts and tagged Hamedan, Hamedan Province, International, Iran, Photos, Theater, Youth on October 10, 2015 by socialinform. The Mehr Theater Group led by Iranian director and writer Amir-Reza Kuhestani will perform “Timeloss” in the American cities of New York and Los Angeles. “Timeloss”, a fiery story about the passage of time, is another version of “Dance on Glass”, which Kuhestani staged in 2001. The play is an entry to “Under the Radar Festival”, a festival tracking new theater from around the world that is taking place at the Public Theater in New York from January 7 to 18. The troupe will have their first performance Friday night. They will have three more performances at the Public Theater until January 18. Their next performance will be in the Segerstrom Center for the Arts in Los Angeles on January 21 and 22. Starring Hassan Majuni and Mahin Sadri, the play will be performed in Persian with English supertitles. The play was staged at the Paris Autumn Festival in November 2014. It has also been staged in Hamburg, Brussels, Frankfurt, Geneva and Rotterdam. Kuhestani is one of Iran’s most successful and prolific playwright-directors. His “Dance on Glass” won international acclaim and toured for four years. He is the first director to win two consecutive awards for the best theater production of the year in Iran for his play “Ivanov” (2011) and “The Fourth Wall” (2012). This entry was posted in Culture, music and arts and tagged Amir Reza Koohestani, Art, Awards, International, Iran, Mehr Theatre Group, Photos, Theater, Video on January 16, 2015 by socialinform. “London, Tehran, Rome, Amsterdam, Reconsider Your Image Of Me” will play from November 16 to December 12 of 2014, every night (apart from Saturdays), at 21:00 o’clock in the Hafez Hall, Tehran. This performance, a co-production between the Virgule Performing Arts Company (Iran) and STET The English Theatre (Netherlands) is supported by the Embassy of the Kingdom of the Netherlands. The opening ceremony was held on Sunday, Nov. 16 with the Dutch ambassador to Tehran attending the ceremony. The performance examines a current topic between Iran and the West, namely what are the images that we have of ‘the Other’ and to what extent fears, fantasies and imaginations are based on truth. By initiating a direct meeting with the Other and listening to each other’s stories, this group aims to create new images, based on the stories of the people who wouldn’t usually make the headlines. The piece is a multi-media, highly physical, speech performance. It includes the actors’ own stories, dialogue between the actors, video installations with short documentaries about daily life in the countries of origin of the actors and video collages of cultural milestones from these cultures. The physical form of the piece produces a third language. The project has brought together an international cast to create this piece during a 2 month rehearsal period in Tehran. The company includes Dutch actress Marene van Holk, Italian actress Marta Paganelli, British actress Amy Strange, Iranian actresses Melodie Aramnia and Neda Jebreilli and Iranian actor Meysam Mirzaei, and the piece has been conceived and directed by Arvand Dashtaray. The production will be performed in the Netherlands in the autumn of 2015. This entry was posted in Culture, music and arts, People & Society and tagged Amsterdam, Art, Culture, England, Foreigners in Iran, International, Iran, Italy, London, Netherlands, People, Photos, Rome, Tehran, Theater on November 30, 2014 by socialinform.